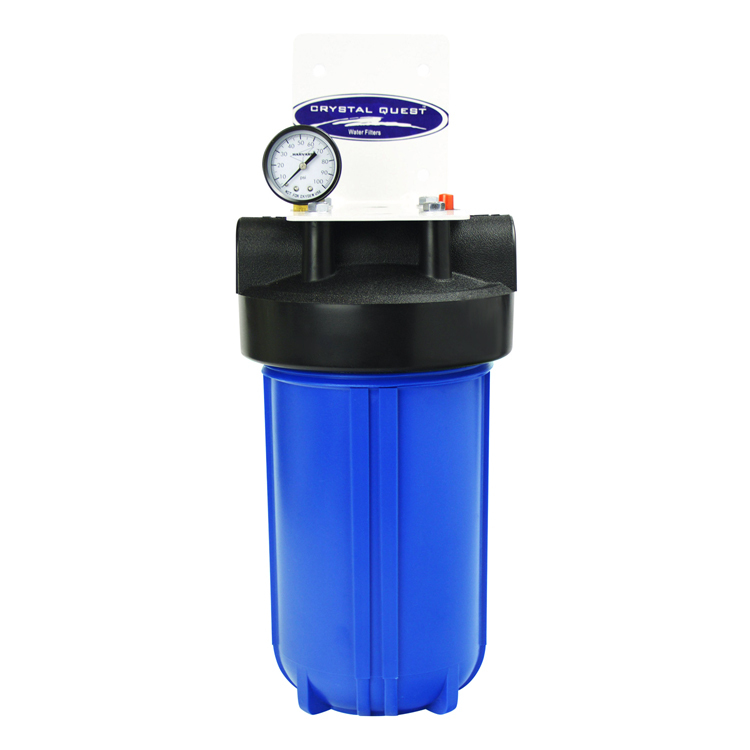 Line Size 3/4" 1" 1.25"
10" Big Blue Whole House Water Filter by Crystal Quest is a 10" x 5" single replaceable cartridge system with 6 stages of filtration guaranteed to deliver healthy, better-tasting water for your family. 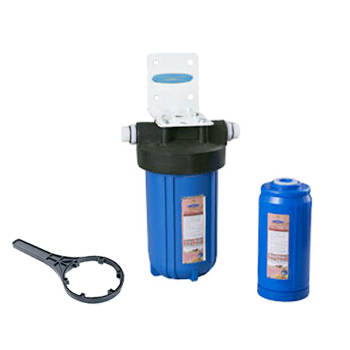 This 10" Big Blue heavy-duty housing packs the standard multi-stage(6-stage) filter with the KDF55 and KDF85 media supported by an Ion Exchange resin and Granulated Activated Carbon or Coconut Shell Carbon. Its slim design allows it to be installed in areas where space is a primary concern. These Whole House Filters are the most comprehensive and cost effective systems available in the market today. They are engineered for maximum filtration and maximum performance with minimal maintenance. This multi-filtration system easily handles your tough water problem providing you with great tasting, safer, softer, cleaner, better tasting water while removing hundreds of other contaminants and providing an adequate water flow. 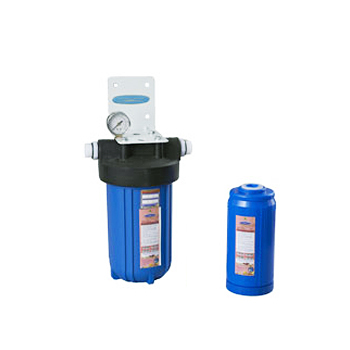 Big blue filters are designed for high-flow water filtration applications. Unique, wide cartridge is capable of filtering enough water for a large house, apartment or busy office! Heavy duty, high flow applications. - These Systems will stand up to 80 pounds per square inch (psi) water pressure. We recommend installing a pressure reducing valve before the System. It will prevent pressure build-up inside when not in use. - We always recommend that a licensed plumber install these products to make sure they are installed properly and to keep from voiding the warranty. - Comes with built-in pressure release valve, pressure gauge and wall bracket.